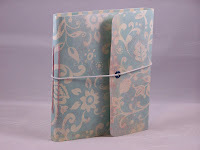 Bookbinding Etsy Street Team: BRR! brought to you by the lovely and wonderful annahawthorne, this book has water- and stain- resistant and practically tear-proof! also, it has all kinds of different scrap papers inside, and we have already established that this is the kind of thing i like. it turns out i also like elastic closures, so this book's definitely a win-win for me. or rather, it will be a win-win for whoever buys it. and they'll be able to win with free domestic shipping. if you'd like to celebrate your own blustery temperatures, you can click the links below; if you'd like to learn a bit more about the lady who's celebrating all these blustery temperatures, you can visit her blog.